The list below is intended as a starting point for questions you should ask when looking for a reputable Siamese cat breeder or indeed when choosing a Siamese kitten. Careful research and consideration should be taken when choosing a cat breeder or kitten. Why do you breed Siamese? Most breeders of Siamese are highly passionate about their chosen breed and could most likely talk for hours about how wonderful their breeds cats and kittens are. If you contact a breeder that seems unsure or lacks passion it is probably best to look elsewhere. Can I visit your cattery? You should always be able to visit a breeders facilities but please remember that they also have a lot to do so they may ask you to arrange an appointment. When you visit it should be clean and tidy and the cats must look in good health. Watch out for sticky eyes or unfriendly animals. Please also note that some breeders prefer kittens to be vaccinated or of a certain age before they can be viewed. Can I see the parents of the kittens? You should always be able to see the Mother of the kittens! Some breeders do not own both parents of the babies. If they do ask to see both parents, if not ask to see the Mother and the entire litter of kittens. Plus any other cats which also share the home. Which registering body are the parents and kittens registered with? In the UK all cats and kittens must be registered with either the Governing Council of the Cat Fancy (GCCF), The International Cat Association (TICA) or Felis Britannica (FB). Cats which have been used for breeding must be registered for breeding to enable the kittens to also be registered. Never buy a pedigree kitten which is unregistered as you will not have a leg to stand on if things go wrong and you will not be able to show or breed from your kitten. All breeders listed on this website register their kittens. Please note that registrations alone are not proof that the breeder is a responsible breeder. What age can the kitten come home with me? 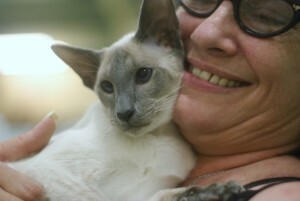 Unlike non pedigree kittens Siamese must be fully vaccinated before leaving the breeder. The final vaccination should be carried out no earlier than 11-12 weeks of age in accordance with the inoculation protocols. The breeder should then keep the kitten a further week to make sure there are no reactions to the vaccines. No kitten should be purchased under the age of 12-13 weeks from a reputable breeder. How are the kittens raised? Indoors is essential, never buy a kitten which is raised in a shed or cage outdoors. The way a kitten is brought up and socialized is very important part of getting a cat with a lovely temperament. If you have special requirements for example a dog, it is wise to try to find a breeder who raises their cats with dogs. Showing is not an essential part of breeding but the two go hand in hand. A breeder who shows will know the standard of points for their chosen breed and will strive to achieve that standard to the best of their ability. It does not mean breeders who don’t show are not producing cats of outstanding quality. What price are your kittens? The price of a Siamese kitten varies depending on a number of factors. You need to tell the breeder if you are looking for a pet kitten, show kitten or a kitten with breeding potential. Some breeders charge the same price for all of their kittens regardless but this is not the case for all. There also seems to be a variation in price depending on the area you live in. The average price for a single kitten is £350 to £500. Beware of kittens that are priced to good to be true, they probably are. What paperwork do I get with my kitten? The minimum paperwork you should receive with your kitten is as follows. Most breeders include lots of other items such as a kitten agreement and other items of general cat care etc. Ask to see this paperwork before you leave the premises with your kitten. If your breeder uses a kitten agreement check the content before you agree to have the kitten. Most breeders will require a deposit to reserve a kitten. Usually this is non refundable and is a way of making sure people think carefully before reserving kittens. Deposits tend to range from £50 to £100. Never pay a deposit on a kitten which has not been born as no breeder can guarantee what they will get in a litter. When choosing a breeder to get your new kitten from you need to make sure you are dealing with a reputable breeder. The questions found on this page are a good start when determining if you have found a breeder you can trust.